‘“Adonai spoke to Moses, saying, “ you will also make a basin of bronze with a bronze stand for washing. You are to place it between the Tent of Meeting and the Altar and put water in in it. Going through the Tabernacle is a progression. This is a progressive walk toward a deeper intimacy with God. This is a time where we prepare to have face-to-face communion with the Living God. It was here at the bronze laver that the priests washed their hands and feet before entering into and coming out of the holy place. 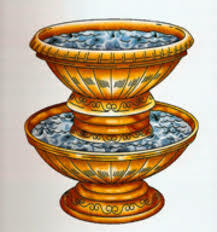 The laver was made from the bronze mirrors of the women and The word “laver” means a bath or wash basin containing water for the purpose of washing. The Jewish priests were commanded to continually wash their hands and feet during tabernacle service. The ancient Jewish Mikvah came from the Laver. In every Jewish community there was a Mikvah, a place of physical and spiritual cleansing. The Mikvah had to be a place of running or flowing water. Not stagnant. John the Baptist, when he was calling out in the wilderness, “baptizing” people in the Jordan River, in a sense he was calling the people of Israel back to the Laver, back to the place of cleansing. This was to be a time of preparation for the “Kingdom of God is at hand”. Yeshua, Jesus was about to come on the scene and John was to herald His coming in Elijah-like fashion. Today, most churches practice baptism, through immersion or sprinkling. This was taken from the Jewish Mikvahs. The Jewish people were very aware of their need for a cleansing before they met with their God. They went to their Mikvahs in preparation for any major life event such as their marriage, to end their mourning after a death of a loved one, etc. Women entered the Mikvahs after each menstrual cycle and after the birth of their babies. (1) It came after the altar (sacrifice first). The appointed priest, as he entered the gate of the outer court, faced the altar, where he made a sacrifice for himself like any other Israelite. Once beyond the altar he was ready to act as a serving priest and so at the laver he prepared himself for the further service of God. He could then minister at the altar or in the Holy Place because he washed at the laver. The altar always came first for the priest. Salvation and then service. God was approached by way of the blood and the water. (2) It came before the door (wash before entering). Within the door of the Holy Place were vessels that represented God Himself. No priest dare enter with any trace of uncleanness. “Be holy as I am holy” was commanded to the priests. (3) It came after leaving the Holy Place (wash before going out). In the outer court everything was bronze. Inside the Holy Place everything was gold. As the priest came out of Gods Presence and back into service he washed at the laver, filled with water for the continual cleansing of the priests as they ministered in the work of the Lord. Read Zechariah 3 and put yourself in the place of Joshua, the high priest. As a called kingdom of priests, this incredible picture is available to all of us, no matter how long we’ve served the Lord. We have to come to the place of realization that we cannot enter into the fullness of intimacy until we submit ourselves to a cleansing through repentance. None of us have “arrived” yet. We all sin, this is part of us as an imperfect people living in a fallen world. “All have sinned and fall short of the Glory of God”, no matter where we are in our walk with the Lord. This life is a journey and none of us have reached our final destination. The Bronze Laver is a type and shadow of our daily need to continually come to the Lord God Adonai and submit to the washing, the cleansing of our sins. I see this also as a type of “beauty treatments”, similar to what Esther submitted herself to in preparation to meet her king. Just as Esther went through a year of preparation to meet with her King, so we must go through a season of preparation throughout our lives so we can meet the King of Kings. Here we are, at the Bronze Laver and we’re very conscious that there is nothing, absolutely nothing we can give the Lord. Here we are, and it’s just us. No titles. No responsibilities. No achievements. No pride. No self-exaltation. It’s just “me”…..facing GOD! We suddenly realize we can’t give the Lord anything, nothing at all. It all came from the Lord in the first place, what can we give Him? We can’t do enough good works, we can’t be “good” enough. None of that matters. And as we gaze into the Laver, we start to notice all of the dirt clinging to us. Imperfection. In light of the Most Perfect God. We are painfully aware at how imperfect we are. Yet the Lord calls us into perfection. (Matthew 5:48) How can that happen? How can we become “perfect” when we see such blatant imperfection in us? As we go to the Laver in our prayer, we suddenly become acutely conscious of our sinfulness, the filth of our sin. Especially after we’ve been walking with the Lord for many years, if we honestly peer into our reflection in the Bronze Laver, we then began to notice our religious ways and our religious attitudes. None of that pleases the Lord. Religion kills. Only an intimate relationship with the Lord will bring us life and life everlasting. If we’ve been walking with the Lord for many years, we slowly start to believe that there is little sin in us, little that needs repenting of. But after our taking a close look at ourselves, honestly scrutinize our walk, we began to see the pride, possibly even arrogance in us. We become sensitive to the fact that we’ve become harsh and judgmental towards others, especially toward those who we don’t think are “saved”. Just as with the Altar of Sacrifice, we come to the realization that we can’t skip over this step before we enter into intimacy with the Lord in the Holy Place, the Bridal Chamber. We cannot bypass the purging and the cleansing we need here. We cannot, we must not go to meet our Beloved looking like this. The Lord is waiting for us, waiting for His beloved bride to make herself ready to meet her Beloved One. As we see our filth, we become acutely aware that we cannot enter into the Holy Place to meet with the Great I AM looking the way we do. We can’t bear it. Our flesh couldn’t bear it. We cannot contain the Glory of God in our filth. We become aware that we cannot do this cleansing ourselves. It’s too much! How can all of that’s in us be gotten rid of? As we come to the realization of all that’s inside us that displeases our Lord, a sense of futility pervades us. It all seems so hopeless! But then the Lord gently reminds us again of Zechariah 3. Joshua, the high priest did not cleanse himself even though he was covered from head-to-foot in dung. The Lord commanded His angels to wash him! The Lord commanded His angels to gently and non-judgmentally remove all of Joshua’s filthy dung laden garments and wash him, cleanse him from the filth of his sin. Then the Lord commanded His angels to dress Joshua with HIS clothing and crown his head with a new Turban! This is so amazing! Here we are, in a place of deep shame because of the depth of the sin we suddenly realize we’ve been carrying. We thought we may have been clean, but there’s so much filth in us that the filth of our sin overwhelms us. But then, just as we are about to despair, the Lord commands His angels to wash us and dress us! The Lord covers us in such beautiful garments! Because of the beautiful robes that are provided for us, we can now enter in. We are now allowed to enter into the Inner Chamber. But it’s not because of “our” righteousness, it’s because of HIM. We have to put on and wear the King’s Robes, the King’s garments before we can enter in.None of this comes from us, none of this comes from our flesh or our own spirits. All of this comes from God. All we are called to do is give the Lord our everything: our pain, our sorrow, our unforgiveness. We are to give the Lord our dreams, our hopes, our aspirations, our accomplishments, even our ministry and our very lives. All that we have and hold great value to are just cheap trinkets. Nothing we can do will impress God. All of this is just junk, tarnished, filthy costume jewelry compared to the beauty and the vastness of the Lord God. We are called to just yield ourselves us, give Him everything. All of it belongs to the Lord anyway! The beautiful robes of righteousness cover our humanity, it covers our frailty. These rich robes even cover our flesh, our sinfulness. They cover the dirt and filth that is still embedded in us and not yet washed or burned off. All of that will come later. We notice that the more often we enter into the Tabernacle, the cleaner, the purer we become. We become more equipped, strengthened with every trip we make into the Holy Place. We gradually become grateful for the Laver, we learn to embrace that place of scrubbing and washing. What an incredible sense to suddenly realize that we can now go in! We now have the freedom to enter in! If you’ve never experienced the freedom and joy of being washed in the cleansing flow of the Lord, you can. Just yield yourself. Lean into Jesus. Give Him your all and let Him sort out all of the junk.